It would be safe to say that the legal battle over hydrofracking in New York State is a confusing one. �Having said that, Governor Cuomo has stated that he will make a decision on this polarizing issue within the next few months. �A recent Quinnipac pole found New Yorkers against hydrofracking by a 46 to 39 percent rate. �This points to a trend in this direction over the past two to three years since hydrofracking became an issue in this state. 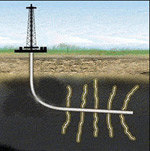 Hydrofracking for natural gas came into being in 1947 but took its present form in 1997. Proponents say that in its current form it helps extract natural gas from shale formations that would not be otherwise accessible. New York State is home to two of these shale formations. The Marcellus Shale formation extends from northern Pennsylvania northward into New York State and extends to approximately Rt. 20 across the state. �The Utica Shale formation extends north from the Marcellus formation to the Canadian border and the western part of New York State. Pennsylvania began drilling in their portion of the Marcellus Shale in 2008. Since that time, there has been a statewide moratorium in New York State so that the long-term health/environmental consequences can be studied. �Gas companies have made preliminary leasing agreements with landowners pending the governor’s decision.�At this time, the decision whether to allow hydrofracking in New York State lies solely with the governor. �While the State Assembly has been willing to introduce legislation banning the practice, the State Senate has indicated they would not support such legislation, so none has been forthcoming. The statewide New York moratorium was due to expire during February 2013. �Prior to that, Governor Cuomo had requested the New York State Department of Health to analyze the possible health hazards and make a recommendation based on their findings. �The Department of Health stated it could take two to three years to make a knowledgeable analysis of these consequences. �In that Pennsylvania has only been fracking for approximately five years, possible long-term health and environmental consequences are not all known yet. �Opponents of hydrofracking point to possible contamination of the water table and increased incidents of stillbirths among dairy animals in areas adjacent to existing gas wells in Pennsylvania as just a two of the possible negative consequences of fracking. �Despite these concerns, Governor Cuomo recently announced that he feels he will have enough information to make a decision within the next few months. �At this time, it is felt that the governor has three possible rulings available to him. �He could ban the practice statewide, issue limited “test well” sights, or grant across the board approval. While the governor has the final decision on a “statewide” policy on gas hydrofracking, each individual municipality has the power to pass their own local policy relative to hydrofracking in their jurisdiction. �At the present time, there are four different categories as they pertain to a particular municipality’s status: 1) Ban in place, 2) Moratorium in place, 3) Movement towards one of those, or 4) No action being considered. �An excellent source of information on this process throughout the state as well as the location of the two shale formations is the web sight “fractracker.org”. �One note of explanation regards the term “fracking ban”. �This is actually a misnomer. �While this is the term used informally, those areas that have imposed “bans� have actually imposed zoning restrictions that prohibit fracking as well as certain other industries that those locales feel is not in their best interest. �While this seems to be a semantic distinction, it could be an import distinction should the gas companies bring suit against those locales. Regarding the possibility of litigation between a gas company and a locale, the New York State Supreme Court recently upheld the Town of Avon’s local ordinance in a suit brought by a gas company that had purchased conditional leases in that town. �Opponents are confident that local ordinances will stand up in court and there is state legislation pending to strengthen the “home rule” stipulation that reinforces the local ordinances. �However, opponents are also quick to say that any gas well in New York State is a dangerous proposition – as water and air are unaware of municipal boundaries. Pollution of the water or air in one area will soon contaminate the water or air in a contiguous area. We at NYIPL ask that all of our members pray that our governor make the right decision in this crucial matter! And if you�d like to tell the governor how you feel, click here. Thanks to John Pick, NYIPL volunteer, for this report. There�s still time to stop Keystone XL!